For SIHH 2019, Girard-Perregaux opted to group all its new novelties along three loose thematic lines — the “aesthetic”, “enticing” and “innerly strong”. The latter two categories were represented by fairly conventional additions to the Cat’s Eye and Laureato collections, but it was the new Bridges Cosmos that drew the most attention. This addition to Girard-Perregaux’s signature Bridges collection isn’t what you’d traditionally think of as an “aesthetic-first” watch, but it does offer a number of sophisticated (not to mention whimsical) complications in a package that goes well beyond conventional watch design. At 48mm, it’s not a low-key watch — and with good reason. The titanium case contains a central hours-and-minutes display, tourbillon and two intricately decorated globes, both of which function as a GMT and star map. 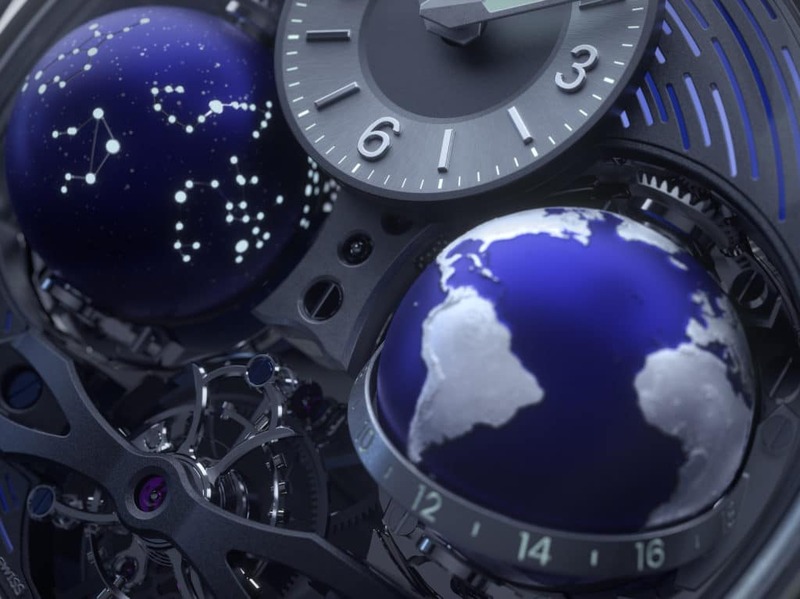 In other words, thanks to its ability to represent the Earth from an immanent and cosmic perspective, the Bridges Cosmos is capable of doing much more than just telling the time — it charts the heavens. The first thing you’ll likely notice about the Cosmos is the asymmetric dial: purportedly designed in accordance with certain geometric rules of Grecian origin, each complication occupies the furthest points along the X and Y axes. Central hours-and-minutes are displayed in a register at 12 o’clock, whereas the tourbillon can be seen at the 6 o’clock position (mounted above one of the large titanium bridges which gives this range of watches its name). At 3 o’clock, a terrestrial globe enables wearers to read a secondary timezone whereas the 9 o’clock entity doubles as a sky chart — offering, under the right lighting conditions, a time lapse of the evening sky. Two planetary bodies representing the celestial (left) and the earthly (right) give this new timepiece its “Cosmos” moniker. The most interesting astrological features are all located in the mid-section. As you can see above, the daytime/nighttime indicator (pictured right) consists of a geographically accurate scale-model of Earth. Continental land masses are represented using raised engravings whereas a hollowing effect is used for the oceans. A reader mounted along the globe’s “equator” functions as a GMT, and along with the globe itself, enables wearers to know whether it is day or night in the secondary timezone of their choice. To the left, the “sky chart” globe is clearly visible and is responsible for imbuing the Cosmos with its sidereal aspect. The globe rotates once every 23 hours and 58 minutes, and utilises dozens of “stars” decorated onto its surface to illustrate the 12 Zodiac constellations that are most commonly referred to in Western astrology. To ensure these constellations are highly visible during each rotational phase, they are decorated with luminescent particles that are laser engraved and filled with hydroceramic. When the watch is worn under normal lighting conditions (i.e. indoors or in broad daylight) two Zodiac constellations remain visible: on the dial, the formation that is usually invisible at noon; and on the caseback, that which can be seen at midnight. 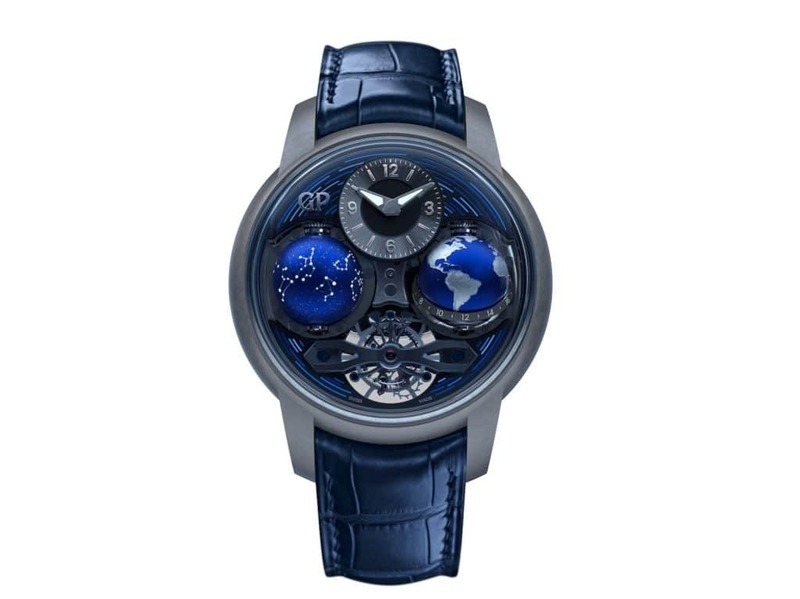 Although the Bridges Cosmos is nominally a “wristwatch”, in order to really grasp its complexity users need to treat it like a planet unto itself – observing all 360º in orbit. The caseback is another interesting aspect of the Cosmos’s design. The decision to forego a winding crown meant that the watchmakers at Girard-Perragaux had to find an alternative means of powering and interfacing with the watch. Their solution was to mount a series of keys, all connected to a specific rod inside the movement, on the caseback. Each of the four keys is tied to a particular function (i.e. 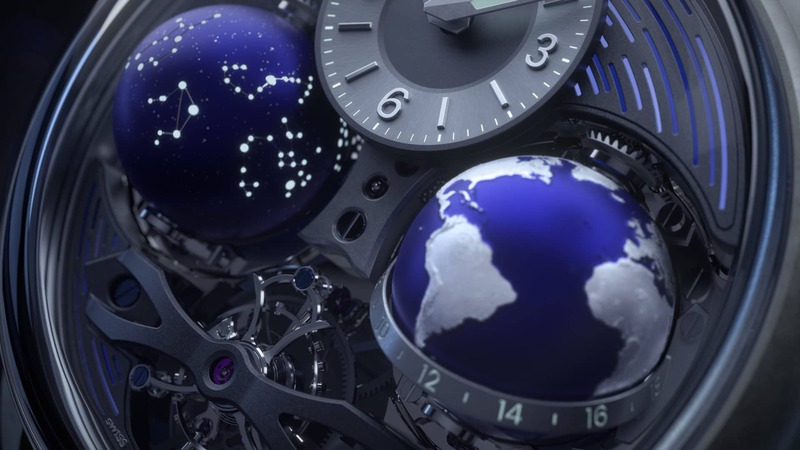 winding, time-setting, adjustment of the star map and GMT indications) and when not in use may be retracted so that they sit flush within the case. Even though the watch uses a key-wound manual movement (the calibre GP09320), it manages a not-inconsiderable 60-hour power reserve. Although most of the finishing isn’t outwardly visible, the tourbillon — based on an intricate design from the Néo range of Bridge timepieces — is on prominent display. Just as well, all the real estate usually assigned to mundane components has been taken up with a representation of the stars. 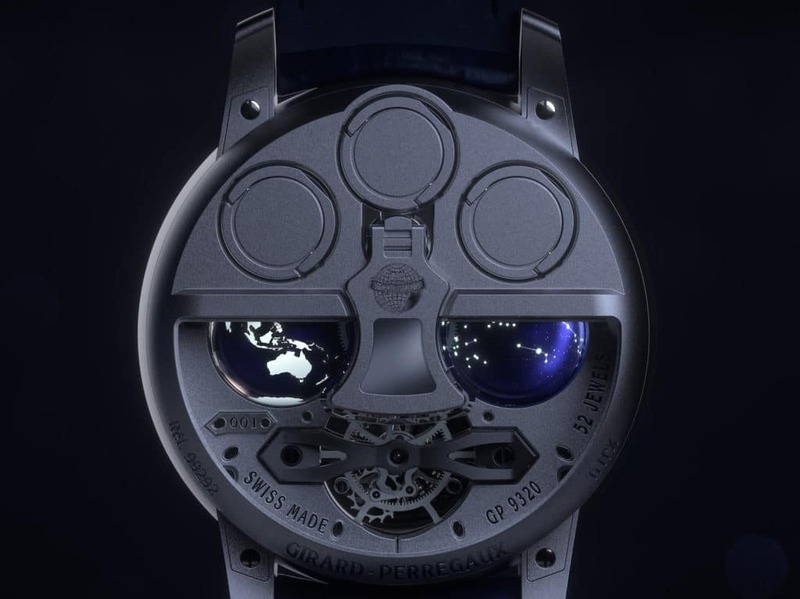 The Girard-Perregaux Bridges Cosmos is available for HK$2,703,000. To learn more, visit Girard-Perregaux online.